More and more people are choosing to express their opinion about an experience they had online through Yelp, Trip Advisor, Google Local and even a company’s Facebook page. Because 90% of customers claim their buying decisions are directly influenced by online reviews, this feedback is a big deal for your business. In addition to swaying a purchase, reviews make up nearly 10% of how search engines decide to rank you in results. So, what are some things you can do to ensure your customer reviews are helping and not harming your business? Make sure the active review sites you are associated with are legitimate. You can do this by claiming your business’s Yelp, Facebook, Google+ or other social profiles and make sure there are no “fakes” out there created to slander. Consumers actively seek out and want authenticity. Your best bet is to let them come organically rather then bribing people to leave you positive feedback. Encourage your customers to leave reviews by linking your social media sites to your website. Train staff to ask. The best time to ask for feedback is when you have delivered them a product they are happy with and you can be proud of; most satisfied customers are more than willing to leave a positive review. First, find out if it is legitimate. The internet is a mixed bag of good and evil and there are trolls who exists to bring a business’s rating down. After determining that the reviewer is a real person with a legitimate concern or issue, treat it as an opportunity for conversation. On Yelp, for example, you can reply to reviews, allowing you, the business owner, an opportunity to respond to the disgruntled customer and see if there’s anything you can do to improve their experience. In addition to starting a conversation, a customer may bring up something negative you had not considered before; instead of being stubborn, use this as an occasion to learn and improve. Reviews on your social media sites, such as Yelp, Facebook, Google+ and Trip Advisor, determine how many customers make it to your business to complete a purchase. 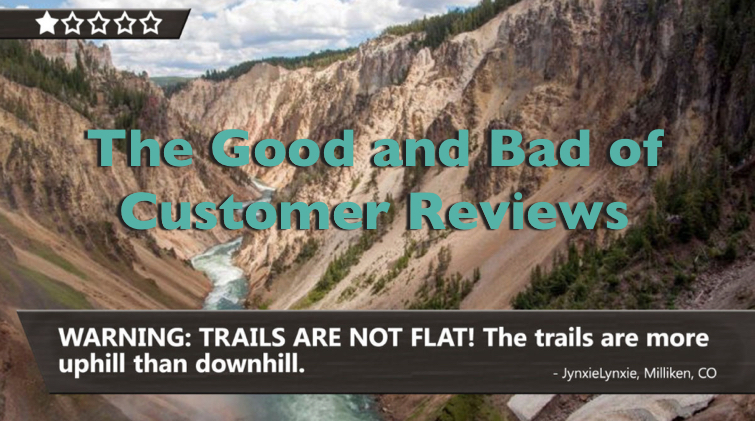 While positive ones build credibility in your brand, too many bad reviews can cause your search raking to suffer. Obtaining good reviews should be a top priority, and if you are suffering, feel free to contact us. We can build a marketing plan for you that will maintain a high ranking and keep you in positive light.